The Original Factory Shop Beauty Event is currently running in store and are having up to 70% off RRP on all leading beauty brands. Now don't be fooled by the term leading beauty brands, because I can assure you, these are big beauty brands - Clinique, Clarins, Calvin Klein, OPI, Elizabeth Arden, Max Factor, as well as high street brands such as W7 and Rimmel. A few of my local towns have The Original Factory Shops, however as I've been that busy lately (hence the radio silence on here again) I have never had the chance to call in. However I have made it my mission to go into my local store to see what is actually on offer and what the stores stock. Initially I thought my local store was in Stanley, however from using their online store finder, I was pleasantly surprised to find that there were more stores closer to where I live, one in the town where I used to go to school which was a blast from the past as I used to go to the shops there on my lunch. Initially when I went into the store I was a bit sceptical as to what brands would be in store, thinking that the most higher end product brand would be Max Factor. How wrong was I. The store I went into had many high street brands such as Max Factor, Rimmel, W7, L'oreal, Olay and Garnier. But they also had a large selection of OPI polishes which included permanent range colours, as well as some of their collections - both full size and minis. In addition to a vast amount of sets by Clinique and Clarins. I picked up their Moisture Surge Set for £12 which came with three products from the range and a small travel bag which fits perfectly into a new designer handbag which I have just purchased. All the items in store which I looked at, had significant savings - OPI nail polishes were £5 each or two for £8 which is an absolute steal. Don't be worried that the stock in store is old, as you can see the OPI polishes are all the new packaging and had some of the more recent collections in store. To put it into context if you wanted to purchase any of these items in store, you would need to travel to a city and for me that would be Durham, Newcastle or Sunderland. Why travel that far when you can buy products cheaper on your doorstep. It is worth noting that the Max Factor range was vast and there was foundations, powders and mascaras which had a wide shade range, however unfortunately the colours were not right for my natural skin. If you do go into store and show them this blog post and state Blogger10 when you are at the checkout you will receive an extra 10% off your beauty purchases. Plus as it's pay week, why not use this as an excuse to treat yourself. I'll be posting separate reviews of the Clinique set and also the OPI polishes over the next few weeks, so keep your eyes peeled for them. *TOFS did provide me with a gift voucher to spend in store, however all views and opinion are my own. So it appears that Summer has been and gone in the UK - I'm currently sat with a hot water bottle on my lap and wrapped up in a massive hoodie. However lets cast our minds back to last weekend, when Summer was upon us and I finally had the opportunity to wear my new Topshop dress. After seeing this on A Style Album, I had to pick it up before it sold out online. 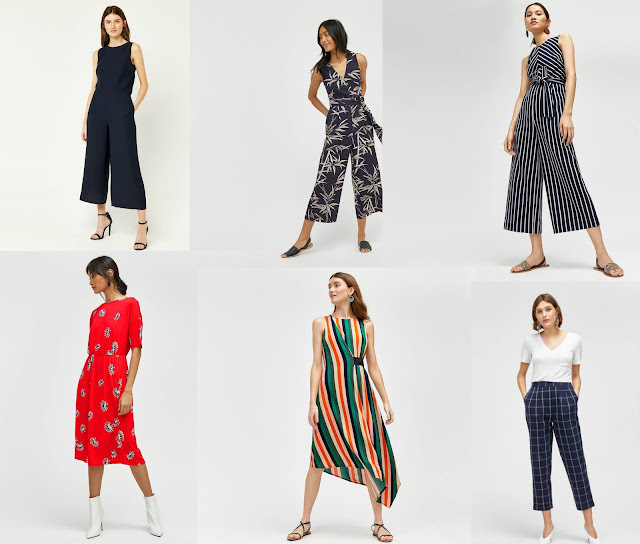 Even though I still haven't really started my mass wardrobe clear out, I do know that my wardrobe is missing on midi dresses - 95% of my wardrobe consists of mini dresses. What I love about this dress is the fact that you can dress it down - like I have done with these buckle boots again from Topshop, or with heels for a night out. It is worth noting that it is near enough backless so for during the day I wear this with a black slip underneath. I feel like once upon a time on here I would share pretty much the majority of my life, however over the last year I've really pulled myself away from what I share online now. I like to keep that air of mystery about me. However what I will share with you is that I have been given a new job - finally got the term senior in my job title (oh the power - jokes). Those who know me, know that my one true love is a good designer accessory, and I feel it's the only way of marking the occasion of me achieving something on a personal level. As much as I would kill for a week or two in the sun (Angela hint hint take me to Florida), we all know where my money is going to be spent. I have been toying with buying the Gucci Princetown Slippers, however going by my track record of ruining shoes, and the fact that I don't see designer shoes as being "special", I think another handbag is going to be on the cards. Unlike my Chanel bags and my Chloe Drew bag, I want a handbag which can be either dressed up or down. I've started to do my research as I will (hopefully) be purchasing it sometime in May. Any suggestions, I'm all ears. Oh and my new hair post will be coming soon - even though you can see it in the picture, Amy is going to share her secrets with you. If you are like me and are desperate to hit that elusive Rouge status at Sephora, you save any splurges for there. Now one easy fire way for me to rack up the Sephora points is to stock up on anything Sol de Janeiro (thanks Angela). However for those based in the UK, Selfridges, Harrods and Cult Beauty stock the brand. However the only gripe I have is the fact that the UK don't get to see any of the value sets which you can find in Sephora. Initially after watching Tati raving about their Brazilian Bum Bum Cream, I had to try this body moisturiser. If you are new to the range, I'd recommend trying their smaller travel sized version before investing in the full size. Honestly I can't get enough of the scent of this moisturiser - for me it's the "Sol de Janeiro" scent. A little bit of this thick moisturiser goes a long way and the scent lingers on the skin - if you use this, you don't need to wear perfume. The moisturiser contains guarana which is a native Amazonian plant which is a form of caffeine. What does caffeine do - stimulates circulation and keeping your skin (and bum) super hydrated and smooth. I've actually got two of these large moisturisers and if I ever need a pick up this is what I reach for. 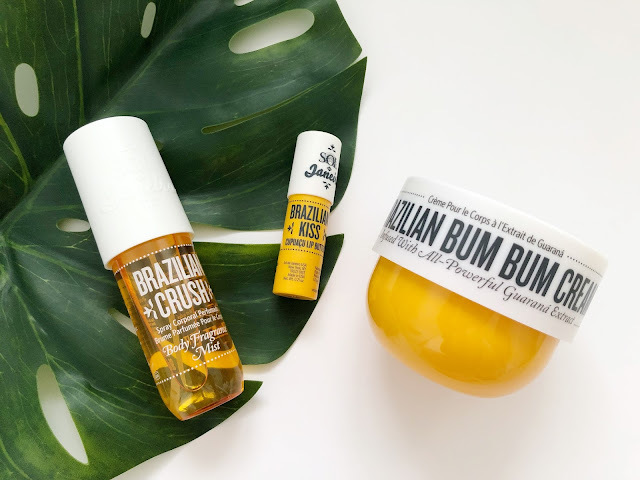 When the opportunity came for my manager to bring me some items back from New York, I was able to grab a value set featuring a large tub of the Bum Bum Cream, but also a travel size version of their Brazilian Crush Body Mist and their Brazilian Kiss Lip Balm. The body mist has become a firm favourite, as it smells of summer and again the scent lasts on the skin all day long. Again if you use this, you don't need to wear any perfume and as the scent is that strong you only need to use a little bit of the body mist. Their Brazilian Kiss Lip Balm, I won't lie, I'm still on the fence about. I honestly don't think it's the product itself which I have the issue with, just the size of the product - it's massive and you don't get much product in it. If it was shaped like a lipstick or a typical lip balm I think this would work better, and I wouldn't be worried when applying as to whether it would end up all over my mouth. After a quick browse on their Instagram account, I have spied that their bath bombs have finally been realised in the US - hopefully these will come to the UK soon. However as I'm in London next month, I've got the Hand Cream on my list of things I want to buy. I'm also debating whether to try their Acai body butter - however I have heard that it contains shimmer. You know I'll end up purchasing a travel size. Are you a fan of Sol de Janeiro, if not you need to try the range. Note - I've just spotted the bath bombs are available on Cult Beauty (roll on pay day and I'm splurging). Has Summer finally been and gone in the UK?? Honestly how lush has the weather been over the last few days, however typical that during said weather I've been ill in bed. Anyway since starting my mass declutter, I've been able to try and revisit some products which I have had and some new favourites have been found. First up to link in with the good weather is Clinique's City Block Sheer SPF 25, which I bought on the recommendation of Caroline Hirons. As I've moved into using acids on my skin (and the fact we have sun), I've been religiously reaching for this. There's no scent to this SPF and it's quickly absorbed into the skin, however this does leave my skin feeling tacky and I can feel it all day. Personally if I'm using this, the only make up I will wear is some blusher, brows and mascara. What I do like though is that this is slightly tinted, this does go once you rub it into your skin, however I do find this is a good guide to make sure that my face is covered. Speaking of acids and another cult product started by the Hirons, is Pixi Glow Tonic. I bagged this little travel size bottle from ASOS for £10, just to try it and I will be buying a full size once this runs out. I've been using this for about three weeks now and I've really seen a difference in the texture of my skin. Does this live up to the hype - YES!! Keeping in with the skincare theme, I've finally opened (yes Angela) some of my Ordinary products and I'm really loving their Hyaluronic Acid 2% + B5. Again this in conjunction with the Pixi Glow Tonic has been working wonders on my skin. However, due to the recent controversy with the brand, this is a brand I cannot support any more, and once these products are used up, I won't be purchasing from Deciem anymore. Whilst fighting over the swarms of people trying to get their hands on Revolution Conceal and Define aka the Tarte Shape Tape due (full review here), I ended up going to a mooch around Superdrug and spotted their new Argon Hair Range and picked up their Argon Hair Therapy Pre-Shampoo Treatment which is a cheaper version of the iconic Elasticizer from Philip Kingsley - £3.99 to be precise. Now that my hair is getting blonder, I've been making more of a conscious effort in keeping my hair in the best possible condition it can be in and this treatment has worked wonders. Basically you use it exactly the same as the PK Elasticizer and the results are the same. I've already recommended this to a few people at work. I find that using this over the PK is that I can get away with a day or two extra without my hair going super greasy. For the price, it's worth trying. Finally, you know my love affair with Tarte and this teeny tiny blusher in Paaaaaarrrtttyyyy from the Sephora birthday gift last year is the perfect peachy pink which I have been wearing to work on a daily basis. I have seen many reviews saying how it's hard to see an impact when using these blushers however I've been using this with a Real Techniques Contour Brush and I'm starting to get through this quite quickly. Like all Tarte blushers when you swatch it with your finger, the colour is very pigmented, however depending on what type of brush you use to apply determines whether you want a sheer wash of colour, or actually show the world that you're wearing blush. Personally I like to go a little heavy handed with this, just so this lasts throughout the day, however if I go in too hard, it can easily be blended out. If you can get your hands on any of their blush sets you won't be disappointed.